Retaining its unique and much praised organization, this leading text has been revised to reflect the most recent developments in design tools. 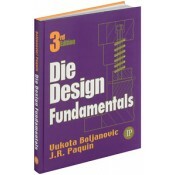 It provides balanced coverage of relevant fundamentals and real-world practices so that students, apprentices and on-the-job professionals can understand the important and often complex interrelationships between die design and the economic factors involved in manufacturing sheet-metal forming products. Following introductory material and a discussion of 20 types of dies in Chapter 2, the design process of a representative die is separated into seventeen distinct chapters. Each chapter is one step which is illustrated in two ways; first, as a portion of an engineering drawing, that is, as the component is actually drawn on the design. Second, the die design is shown pictorially in order to improve the user’s visualization. In successive sections each step is detailed as it is applied to the design of the various types of dies listed in Chapter 2. • Includes English and Metric systems. • Covers new methods of producing blanks, such as waterjet cutting and laser cutting. • Contains a glossary of terms for the first time. • Illustrates each step in pictorial view and as a portion of an engineering drawing. • Offers a completely revised chapter on presses and quick die-changing systems and includes the addition of “Quick Die Change Systems.